Our guild was blessed to have the legendary Bonnie Hunter this month as our National Speaker. She was here April 2012. Back then guild days generally consisted of....work. I took the day off to go to the guild meeting, however, no classes, just an in and out. Retirement is nice. This time...2 classes. I now have 2 more UFO's on the list. It is so worth it. I have been active in our guild for more than 15 years. I know many of the members. If someone needs a helping hand (as I am younger than many-it used to be most) I will carry, hoist, drag, climb or lift for those in need. 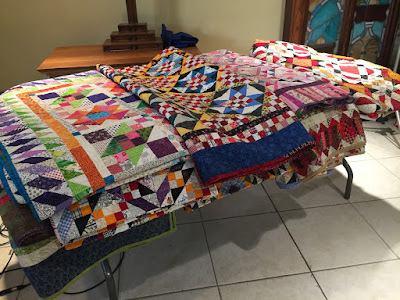 Bonnie needed help with her quilt bags...into the building, down the stairs, and even onto the table. And after taking classes for 2 days, I was a familiar face. Our meeting room was the location for Vacation Bible School. We all needed to chip in and quickly turn the room around before the 165 people arrived. The Sunday class was Scrap Crystals. This block is just 1/2 square triangles (with the easy angle ruler) and squares. Color, accuracy and 96 pieces make up this block. We had 38 ladies in the class....this was the end product of a 6 hr. class. My block is the darker background with purple. The progress has been slow. Here are the 2 blocks now completed. 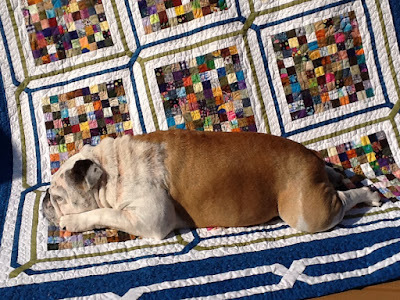 Hoping to have a little Quilt Cam time with Bonnie today. This is usually the only time I clean my area. 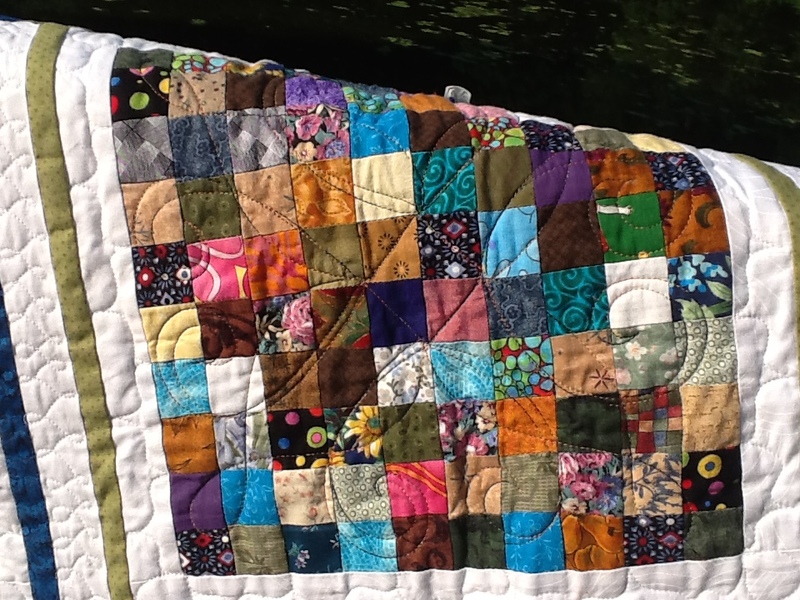 Finished Up the quilting and binding. 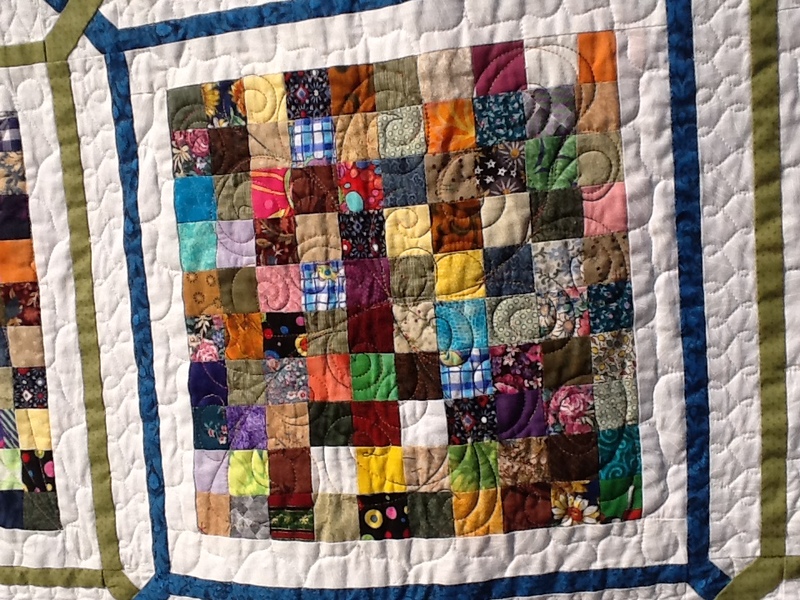 Here's the quilt. 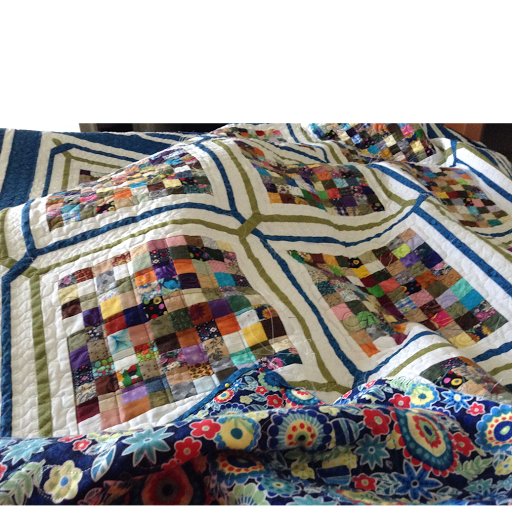 After some car rides last weekend, the binding is done just in time for Bonnie Hunter to see it for Show and Share. 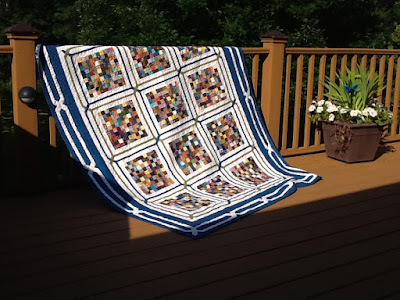 The Quilter's Scrapbook pattern is designed by Canuck Quilter. I just love looking at all the pieces. It brings back all the quilts given to loved ones over the years. This quilt top is a from 2012. I just might have to make a new one with all the current leftovers. This quilt gave some practice on the long arm. The spiral designs turned out great. 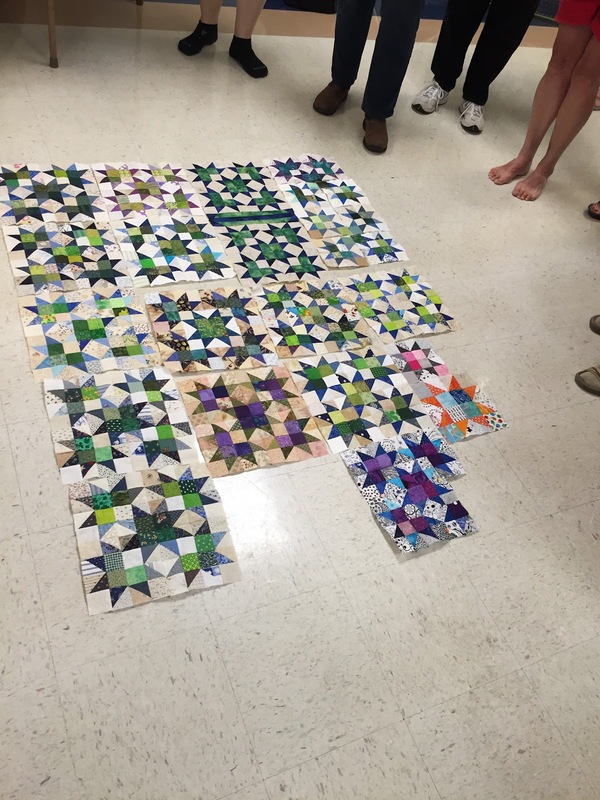 a different design in each block. These spirals are so forgiving. 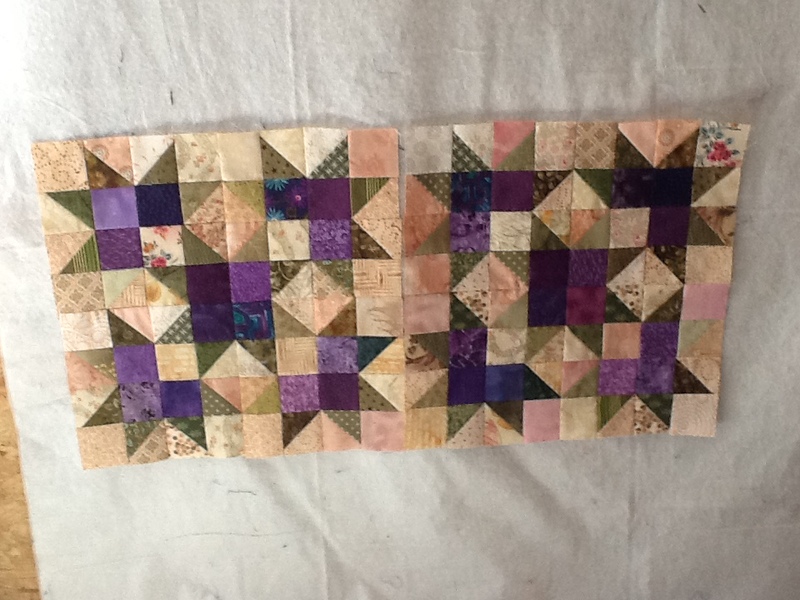 There is some straight line ruler work in the quilt. The lines aren't straight. No pictures. No proof. Always something different to try. Those corner loops were just added to bring the design into the corner better. This is my youngest in the house. She arrived in January 2015. She left a house a full house where she couldn't get along with her brother and sisters. Here she is the Queen. She loves to sleep while I sew. She took a quick nap in the sun while I took the few pictures. She found the spot and was all cozy while the block pictures were taken.